Disclosure: I was provided a Dell XPS 13 Ultrabook for the purposes of this review, however all opinions are my own. It’s been over two weeks since we returned home from our amazing Western Caribbean Spring Break cruise. I’ve been so busy catching up on work since we got back, that it feels like it was ages ago. Luckily, I have lots of fun pictures and can relive everything through them. Having the Dell XPS 13 laptop with me on the trip was such a blessing. I was able to quickly upload pictures and edit them each day, and do “fun” work like brainstorming blog and business ideas while enjoying the fresh ocean air from the Lido deck. The lightweight Dell XPS 13 was the perfect travel companion. I could easily fit it into my beach tote or carry it on its own. It’s sleek and stylish design made me proud to walk around the ship with it. The best part about the Dell XPS 13 for travel is it’s battery life. I didn’t have to bring the power cords with me, because even after hours of running Photoshop and Lightroom, the battery still lasted. I charged it every night and felt confident that it would hold its charge throughout the next day. Another thing I really enjoyed while using the Dell XPS 13 on my cruise was it’s lightning fast start-up speed. There were times when we would get settled in one location on the ship, but then get annoyed with little kids running around screaming– or feel a sudden craving for pizza and ice cream and want to move to the Lido deck for some food. I loved not having to wait forever for my computer to reboot. I could re-open the laptop in our new spot and be back to work within seconds! The touchscreen and infinity display are to die for. The Quad HD+ display with its 5.7 million pixels brings my photos to life. I loved being able to scroll through them all with the swipe of a finger. Whenever I use my Macbook Pro now (which only happens when my husband wants to use the Dell), I find myself touching the screen out of habit. After a week of traveling with the Dell XPS 13, it has become an essential part of my life. I even canceled my AT&T service for my iPad, because the capabilities and convenient size of the Dell XPS 13 make it a much better choice for working on-the-go. I can’t rave enough about this powerful little ultrabook– the only thing I can say is to try it out for yourself and see the difference!! 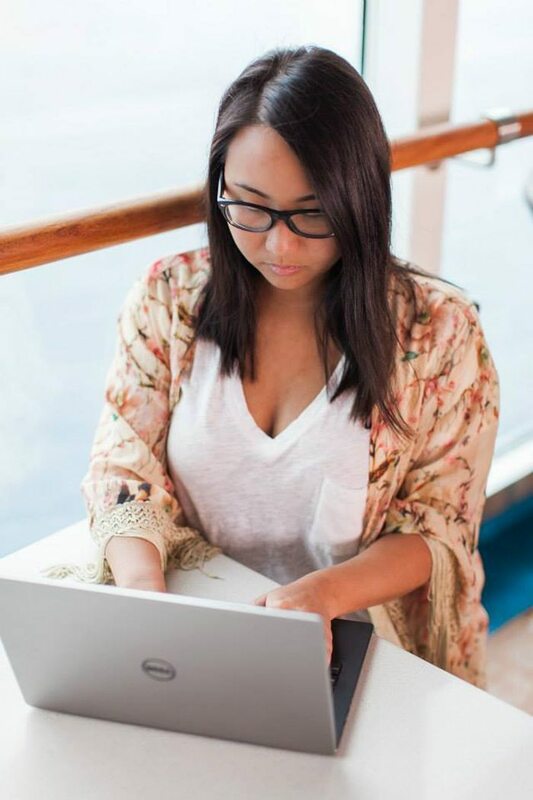 The Dell XPS 13 is a must have for the stylish, tech-savvy traveler! Purchase yours through Dell or Microsoft.